FLUMOX Film Coated Tablets: Polyvinylpyrrolidone (Povidone K 30), crospovidone, microcrystalline cellulose PH 101, colloidal silicon dioxide (Aerosil 200), magnesium stearate. FLUMOX Capsules: Maize starch, microcrystalline cellulose, talc purified, colloidal silicon dioxide, magnesium stearate. FLUMOX Dry Mix: Colloidal silicon dioxide, carboxy methylcellulose sodium, lactose, propyl para-hydroxybenzoate, sodium citrate anhydrous, sucrose, cherry flavour oil, saccharin sodium, sodium cyclamate, asparatam, veltol plus, avicer RC 591. Respiratory tract infections: Bronchitis, pneumonia and empyema. Ear, nose and throat infections: Otitis media, sinusitis, tonsillitis and pharyngitis. Gastrointestinal tract infections: Enteritis, cholecystitis, typhoid and paratyphoid, mperitonitis and intra-abdominal abscesses, and biliary tract infections. Genitourinary tract infections: Cystitis, pyelonephritis, prostatitis, gonorrhoea, and puerperal sepsis. Skin and soft tissue infections: post- operative wound infections, boils, carbuncles, abscesses, cellulitis. Other infections: Septicaemia and endocarditis. The Usual Oral Dose is FLUMOX 250, 500, or 1000 every 8 hours. Children up to 10 years of age: They may be given 125 to 250 mg every 8 hours. In infants less than 3 months old: The maximum dose should be 30 mg/kg daily in divided doses every 12 hours. To make up first shake the bottle to loosen powder, then add the volume of water stated on carton box to the content of bottle and shake well. Once reconstituted, FLUMOX must be stored in a refrigerator and used within 10 days. Doses should be reduced in severe renal impairment. Concomitant administration of amoxycillin and anticoagulants from the coumarin class, may prolong the bleeding time. A dose adjustment of anticoagulants may be necessary. As with other penicillins, side-effects are usually infrequent, mild and transient including diarrhoea, indigestion and skin rashes. 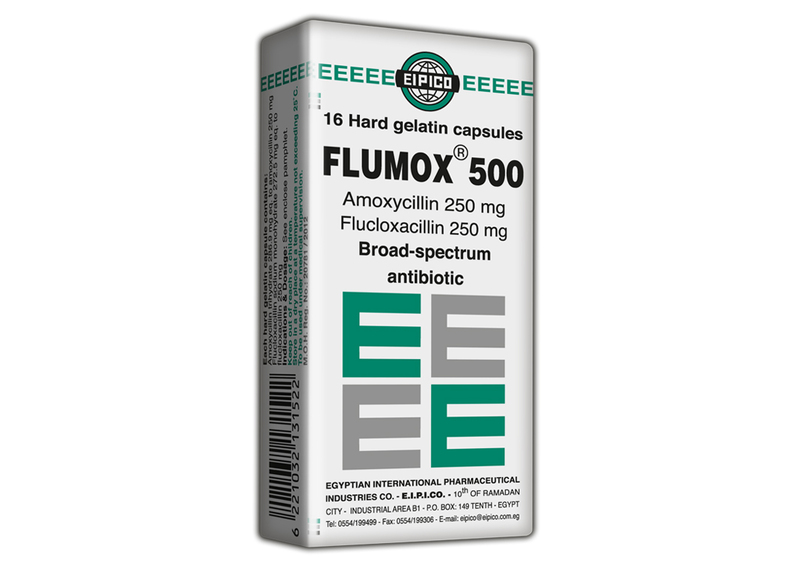 FLUMOX is a combination of two semi-synthetic penicillins: amoxycillin (a broad-spectrum penicillin) and flucloxacillin (a penicillinase-resistant penicillin). This combination exhibits a bacterial activity against a wide range of Gram-positive and Gram-negative microorganisms. Penicillinase-producing and non-penicillinase-producing Staphylococci, Streptococcus pyogenes, pneumoniae, and faecalis; Corynebacterium diphtheriae, Clostridia spp., Bacillus anthracis; H. influenzae, Moraxella (Branhamella) catarrhalis, N. gonorrheae and meningitidis, E. coli, Proteus mirabilis, Salmonella, Bordetella pertussis, and Bacteroides melaninogenicus. Both amoxycillin and flucloxacillin are acid-stable and are well-absorbed after oral administration. Amoxycillin is more rapidly absorbed than ampicillin producing higher plasma concentrations than those obtained with the same dose of ampicillin. Peak plasma concentrations of amoxycillin and flucloxacillin are achieved after 1-2 hours. Amoxycillin and flucloxacillin are metabolized to a limited extent, and the unchanged drugs and metabolites are excreted in the urine by glomerular filtration and renal tubular secretion. Store in a dry place at a temperature not exceeding 25°C, and protect from light. Flumox 1000 Film coated Tablets: Box containing 3 (Al/PVC) strips of 5 film coated tablets each. Flumox 250 mg Capsules: Box containing 2 strips of 6 capsules each. 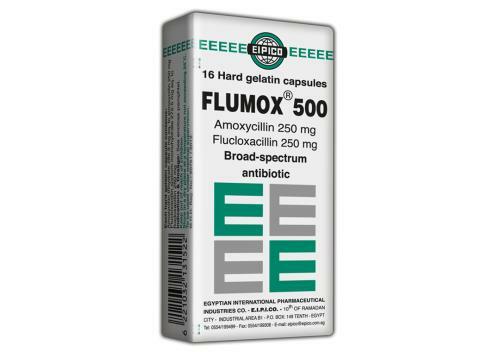 Flumox 500 mg Capsules: Box containing 2 strips of 8 capsules each. Flumox Dry Mix: Box of 100 ml suspension after reconstitution.